Name of the Experiment: Determination of GSM of woven and knitted fabrics. The GSM of fabric is one kind of specification of fabric which is very important for a textile engineer for understanding and production of fabric. ‘GSM’ means ‘Gram per square meter’ that is the weight of fabric in gram per one square meter. By this we can compare the fabrics in unit area which is heavier and which is lighter. To determine the GSM of the given samples of fabric. To compare the GSM of them. The weight of a fabric can be expressed in two ways, either as the ‘weight per unit area’ or the ‘weight per unit length’; the former is self explanatory but the latter requires a little explanation because the weight of a unit length of fabric will obviously be affected by its width. In woven fabric, the weight per unit length is usually referred to as the ‘weight per running yard’. It is necessary therefore to know the agreed standard width upon which the weight per running yard is based. Usually this width depends upon the width of loom. Before coming the term ‘GSM’ there was another term called ‘lb/100 yards’. This expression is used by British Standard. For measuring this there are a template and a quadrant balance. The template area is 1/100 square yards of which each arm is 1/10 yards in length. For measuring GSM, a GSM cutter is used to cut the fabric and weight is taken in balance. Both of these measurement and method is equally used for both woven and knitted fabrics. Standard atmosphere: temperature – 20oC and relative humidity - 65%. Brand: Good brand & Co. Ltd. Scale: 100 yards for fabric. For measuring with Quadrant balance, at first we should cut the fabric sample according to the template area. By this way we cut 10 woven samples and 10 knitted samples. Now weigh these samples in pounds by quadrant balance according to 100 yards scale. By this way we get the weight in pound per 100 square yards fabric. 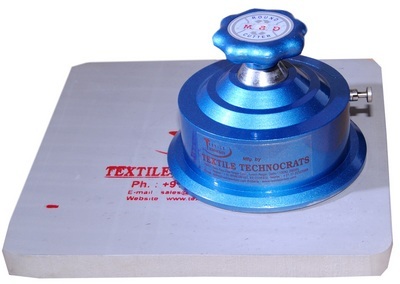 For Measuring GSM, we should cut the fabric sample by GSM cutter. By this way cut 10 woven samples and 10 knitted samples. Now weigh these samples by electric balance in grams. By this way we get the weight in gram per one square meter fabric. Now find out the average of these found weights. For woven fabrics find out the weight per running yards assuming the loom width 48 inches. Weight of 100 yd2 woven fabric = 19.2 lbs. Weight of 1.33 yd2 woven fabric = 0.255 lbs. That is weight of fabric per running yard is 0.255lbs or 116 gms. The weight of woven fabric is 19.2 lbs/100 yd2 or 106.83 GSM. The weight of knitted fabric is 36.8 lbs/100 yd2 or 145.37 GSM. The weight of woven fabric per running yard is 0.255lbs or 116 gms. This is a direct measuring tester. So the result should be accurate. But as the samples are of both cotton fabrics, so there are effects of moisture content on the weight of fabrics. Besides the knitted fabrics are very much extensible and proper relaxed state is quite different during cutting of sample with GSM cutter. Therefore there are variations among their weights. The effects of moisture content can be accounted for either by conditioning the specimen in the standard atmosphere or by taking the specimen to oven dry weight and adding the official regain.